Recap / Star Trek S1 E28 "The City on the Edge of Forever"
"'Let me help.' A hundred years or so from now, I believe, a famous novelist will write a classic using that theme. He'll recommend those three words even over 'I love you.'" "As I'm watching the episodes for reference just before drawing each strip, I take notes on ridiculous stuff that I can make fun of in the comic. Things that pull me out of the story and make me think, "That makes no sense. I can make a gag about this bit." For most episodes I have anywhere between 10 lines and half a page of notes. When this episode ended, I had written nothing." In the penultimate episode of the first season (credited to Harlan Ellisonnote who wrote the story but not the teleplay - see the Trivia tab for all the gory details), the crew of the Enterprise finds itself exploring a "temporal disturbance" near an unknown planet. Electromagnetic interference causes the ship's computer to explode, injuring Sulu. McCoy runs to prepare an injection of super-adrenaline for him, but turbulence causes him to accidentally inject himself and become Brainwashed and Crazy. McCoy escapes the bridge and beams down to the planet. Following him, the landing party discovers a city of ancient ruins that appears to be uninhabited and empty except for a mysterious glowing green archway, which appears to be sentient and exhibits strange telepathic abilities, acts as a viewscreen displaying various scenes from Earth history. The archway, which calls itself the Guardian of Forever, explains that it is a portal to any place and period in history. It also easily steals Spock's Cultural Posturing crown. The conversation with the Guardian is interrupted when McCoy runs through the archway and disappears. Moments later, Uhura reports a loss of contact with the Enterprise, and the crew realize that McCoy has somehow altered the course of history since entering the portal. In order to return to their ship and restore the original timeline, they must follow him and prevent him from doing whatever he did. Steeling themselves to find the correct moment in history, Kirk and Spock jump through the portal and arrive in New York City during The Great Depression, where the pair must disguise themselves while they search for McCoy. Unfortunately, their Starfleet uniforms (and Spock's Vulcan ears) attract unwanted attention. When the pair attempt to steal clothes, they are chased by the police and end up hiding in the basement of a homeless shelter run by the kind, idealistic and smart social worker Edith Keeler (Joan Collins). Keeler offers to take in Kirk and Spock and find them work, although she is slightly suspicious of their military demeanour. While Kirk and Spock do menial jobs, Spock is able to construct a rudimentary computer using electronic parts he has assembled, which he uses to analyze his tricorder's recording of the historical scenes shown in the archway. Kirk and Edith begin to fall in love. Spock discovers a terrible truth: Soon after he entered the portal and arrived on Earth, McCoy saved Keeler from dying in an auto accident. Since she did not die as intended, she later became a peace activist and successfully convinced Franklin D. Roosevelt to keep America from entering World War II until too late, allowing the Nazis to win and preventing Starfleet from ever existing. Kirk and Spock realize that in order to prevent this from happening, Edith Keeler must die. Meanwhile, McCoy has been running loose in the city, still affected by the drugs. After an altercation with a homeless man who steals his phaser and shoots himself with it, he is found and taken in by Keeler, who believes he is merely drunk. As he recovers from the drug's effect, he befriends her, unbeknownst to Kirk and Spock. The following night — the night of her accident — Kirk takes Edith on a date to the movies. An offhand comment by Edith reveals to Kirk that she knows McCoy. When Kirk and Spock run into McCoy on the street, Edith walks into traffic to find out what's going on. Kirk instinctively moves to push her out of the way, but Spock insists he not interfere. When McCoy moves to save her, Kirk restrains him, and Edith is struck by a car and dies, returning history to its original course. McCoy is shocked and furious, demanding to know why Kirk stopped him from saving Edith and if he knows what he's done. Kirk is too heartbroken to say a word, and Spock gently tells Bones that "he knows". With the timeline restored, the three are able to return to the planet through the portal, where the Enterprise has reappeared. Scotty expresses surprise at the short time that's elapsed since they left. The Guardian offers to show the crew more fantastic journeys, but an emotionally shaken Kirk simply states "Let's get the hell out of here" and prepares to have the crew beamed back aboard. In 2015, IDW published a comic book adaptation of Harlan Ellison's original script of this story. Always Save the Girl: Averted; Kirk chooses to kill Edith rather than let Hitler win WWII. America Saves the Day: Implied that this happened in World War II, since America staying out of the war in Europe apparently allows Germany to defeat both Britain and Russia. Somewhat justified as the Nazis develop nuclear weapons as a result and that's not good for anybody. America Won World War II: Due to pacifist movement USA did not enter WWII, and Hitler won precisely because of it, causing humanity to be enslaved and never reaching the stars. Artistic License  History: Edith's fate is pinned on the reveal that neither Kirk nor Bones know who Clark Gable is. The episode takes place in 1930, so in fact Edith shouldn't have known who he was, either - he was just a bit player in 1930; he didn't become a star for another two years. Reportedly at one point the script used the name of a lesser-known (to 1960s audiences) actor named Richard Dix, but by the time the episode was filmed it was decided to use the better-known Gable, despite the anachronism. Bamboo Technology: Spock has to create a massive crude circuit array for his tricorder to display its recordings from the Guardian, and he complains that he has to work with the 1930s equivalent tech resources of "stone knives and bear skins." Of course, when Kirk drily remarks that it would be an extremely complex problem in logic, and that perhaps he expects too much of Spock sometimes, the science officer is quick to take up the challenge. Big Applesauce: Of all the places on Earth to which Bones (and later Kirk and Spock) could travel, he happens to choose New York City. Bittersweet Ending: This episode sets the bar for tragic Star Trek endings. Edith dies, leaving Kirk a broken man, but the future continues as normal. Clothesline Stealing: Kirk and Spock take clothes to blend in in 1930s America. They get noticed by a police officer. Cover Version: The 1931 popular song "Goodnight, Sweetheart" (written by Ray Noble, Jimmy Campbell, and Reg Connelly) is performed by the series orchestra (in an arrangement by the episode's composer, Fred Steiner), though it is shown to be playing on the radio in the scene (marking a rare use of diegetic music for the series). Accordingly the arrangement is very much in the style of popular music in the 1930s, with a brief vocal section (provided by an unknown and uncredited session vocalist) followed by a lengthy instrumental section. Kirk: Then what is it? Guardian: A question. Since before your sun burned hot in space and before your race was born, I have awaited a question. Guardian: I am the Guardian of Forever. Kirk: Are you machine, or being? Guardian: I am both... and neither. I am my own beginning, my own ending. Spock: I see no reason for answers to be couched in riddles. Guardian: I answer as simply as your level of understanding makes possible. Spock: A time portal, Captain. A gateway to other times and dimensions, if I'm correct. Guardian: As correct as possible for you. Your science knowledge is obviously primitive. Kirk: (enjoying every minute of this) Annoyed, Spock? Cut Himself Shaving: Kirk stumbles for an response when a suspicious cop notices Spock's pointed ears. Finally, after Spock suggests "the unfortunate accident I had as a child", he explains that Spock caught his head in a mechanical rice-picker. Dramatic Irony: The very ideals and beliefs which Edith Keeler espouses (achieving world peace, traveling into space, curing disease, feeding the hungry) are all ones which are achieved in the time period of the series under Starfleet. But in order for this to happen, not only must the United States enter a great world war first that will kill millions of people, Edith herself must die. Dramatic Shattering: A random vagrant is so frightened by Bones' appearance that he drops a glass bottle of milk. Explosive Instrumentation: At the beginning of the episode, leading to Bones breaking out the cordrazine. Fish out of Temporal Water: When they first arrive in New York in 1930, Kirk and Spock stand out like sore thumbs because of their Starfleet uniforms and Spock's Vulcan ears. Even after they are able to "borrow" clothes (and a woolly hat to hide Spock's ears), their ideals and behaviour mark them as strangers to the era, which does not escape Edith's notice. Foreshadowing: Almost the first thing to happen to Kirk and Spock when they arrive in the past is that they're nearly run over by a car. For Want of a Nail: Spock explains to Kirk that because Edith Keeler was not hit by a car and killed in 1930, she became the leader of a pacifist movement that delayed American entry into World War II for so long that the Nazis developed the atomic bomb first, and neither Starfleet nor the Enterprise ever existed. Gaussian Girl: Edith Keeler is exceptionally blurry in all close-ups, even by Star Trek standards. Godwin's Law of Time Travel: To quote Spock in David Morgan-Mar's treatment of this episode in Planet of Hats, "It's the First Law of Time Travel. [...] Time travel: ergo, Hitler." Bones going back to 1930 and preventing Edith Keeler's death causes the Nazis to win World War II. Heroic BSoD: Kirk ends the episode in one of these. Home Version Soundtrack Replacement: Accidentally averted. The DVDs were originally going to have "Goodnight, Sweetheart" replaced by generic music for monetary reasons. Then the DVDs were made with the song still in so Paramount paid the money. Chuck!Spock: Perhaps your new name could be something like "Butterfingers on the Edge of Whoopsie, Did I Do That?" Chuck!Guardian: I've succeeded! Just in a way far beyond your comprehension! Chuck!Spock: Yeah, that's not working anymore. Kill the Cutie: Edith Keeler devotes her life to helping the many poor and hungry of the Great Depression, and is convinced that humanity can achieve great things if they could only set aside their petty squabbles. Kirk is fascinated by her altruism and idealism and falls in love with her. And then Spock tells him that she must die if the timeline is to be restored. Leitmotif: "Goodnight, Sweetheart" is their song. Mad Scientist Laboratory: Spock's primitive computer workshop is a small-scale version of this, including an entirely gratuitous Jacob's Ladder. Missed Him by That Much: McCoy is led out of the soup kitchen just as Spock shows up to serve. The Needs of the Many: Kirk falls in love with Edith Keeler, partly because she has the same ideals upon which Starfleet would later be founded. But if he allows her to live, millions will die who did not die before, and Starfleet will never exist. He is forced to let her die to restore the timeline. Not That Kind of Doctor: Inverted when, upon hearing that Edith has a friend "who talks about Earth in the same way you do" and offers to introduce him, Bones tells her, "I'm a surgeon, not a psychiatrist." Notable Original Music: Although this is the only episode to use music not specifically composed for the series, the musical cues featured in the episode are unusual for a different reason. Because the partial score composed for the episode incorporates cues from the copyrighted "Goodnight, Sweetheart", and because this episode aired so late in the first season, and because new recordings of music were conducted for each season (under union rules), all of the music composed for this episode is heard only in this episode - a vanishingly rare case indeed for a show which quite famously reused the same dramatic cues in dozens of episodes. Obstructionist Pacifist: Edith Keeler is one of these. There's nothing wrong with her ideas of world peace and humanity working together to improve themselves (if anything, it draws Kirk's eye even more, coming from a time where views like hers have actually come true). But unfortunately for the rest of the universe, this is not a mentality that is good to have (or force the U.S. to have) in the middle of World War II. Pop-Cultural Osmosis Failure: Bones is well-aware of what movies are, but hasn't a clue who Clark Gable is. Portal to the Past: The Guardian of Forever can not only display recordings of events at any time in Earth's past, but also allow the interested explorer to travel back to those times. Precision F-Strike: "Let's get the hell out of here." The effect is obviously lost for modern viewers, but "hell" was pretty shocking for 1960s television (contrast Kirk's slightly awkward line "Go to the Devil" from "Day of the Dove"), and they had to fight the network watchdogs to keep it in. Psychic Powers: The Guardian of Forever remains cryptic about its true nature (to Kirk's question "Are you machine, or being? ", the Guardian answers, "I am both - and neither. "), but it can communicate with the Enterprise landing party despite having no mouth or ears. Reality Ensues: Kirk and Spock travel back in time to Depression-era New York in order to avert a disastrous event that changed history, but they don't know what it is. Fortunately for them, the information is stored on their tricorders. Their tricorders are damaged and Spock works to fix them, but he quickly finds it almost impossible. No matter how smart Spock is, the tricorder is centuries ahead of the most cutting-edge technology available at the time, and he's been trained to use highly advanced tools in a time where getting a pound of pure gold or platinum for your amateur electronics project is no simple matter - he compares it to working with "stone knives and bearskins". He's reduced to working with consumer-grade electrical goods such as lightbulbs and radio sets, and can only get a few seconds of functionality out of the tricorder after days of work. Also, in order to buy those materials he and Kirk need to work menial odd jobs and live in a homeless shelter, and in order to fit in they steal clothes off a clothesline... where they are promptly confronted by a police officer. Reckless Gun Usage: After the still heavily-drugged Bones passes out in the middle of a paranoid rant to an alarmed bum, the bum searches his pockets for money or valuables and finds his phaser. He inspects the strange device and presses a button on it - while pointing it at himself. He is promptly disintegrated. Reset Button: According to the Guardian, if they were successful in restoring the timeline, "It will be as though none of you had gone". Then, this would indicate that the bum who accidentally killed himself with McCoy's phaser is restored to life. And from Edith's point of view, she never met any of them before she died. However, Kirk still remembers. Ruins for Ruins' Sake: The planet inhabited by the Guardian of Forever is covered by ruined stone columns. What they are doing there is never explained.note The use of this trope is accidental; the script describes the planet as being covered in ancient runes. Save This Person, Save the World: Inverted; in this case, it's Kill This Person, Save the World. If Edith Keeler lives, the Nazis win World War II, and Starfleet is never founded. If she dies, history continues as normal. The Guardian's final words definitely give the impression that the writing staff intended to make further historical stories. Unfortunately, it never happened - at least in this series. It gets a proper sequel in the animated series episode "Yesteryear". The Guardian — or its big brother — gets a further work-out in the fan-made episode "In Harm's Way". Set Right What Once Went Wrong: Inverted when Bones goes back to the past and prevents Edith Keeler's death, thereby preventing Starfleet from ever existing, then played straight when Kirk and Spock have to follow him and prevent him from preventing Edith Keeler's death. Shoot the Shaggy Dog: Much of the episode focuses on Kirk's growing romantic attraction to Edith. But at the end of the episode, he is forced to set his feelings for her aside and let her be hit by a car and killed in order for the timeline to be restored. Slasher Smile: Bones briefly has one . Stock Footage: The Guardian of Forever shows history via stock footage from old films and newsreels. One shot of a sailing ship firing, taken from the 1945 Swashbuckler The Spanish Main, was later used twice on Star Trek: Enterprise, in the episodes "Storm Front" and "In a Mirror, Darkly." The Story That Never Was: The episode ends with this trope implied, the crew find themselves on Earth in the '30s after McCoy ends up accidentally drugged and falls through a mysterious portal, which causes the Enterprise to disappear. While they look for him, they meet a beautiful woman who they eventually realise became a peace activist who delayed America's entry into WWII just long enough to lead to a Bad Future. 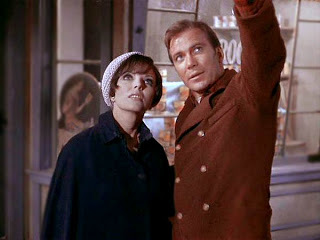 Kirk is forced to grab McCoy when he moves to prevent her from being run over while crossing the road (as presumably happened with Bones present, but not Kirk). Sufficiently Advanced Alien: Either the Guardian itself, or whoever built it. Time Travel Romance: Kirk and Spock travel back in time by several centuries, where Kirk falls in love with "temporal local" Edith Keeler. Unwitting Instigator of Doom: Both McCoy and Edith Keeler. Wham Line: "Edith Keeler must die." What the Hell, Hero? : Bones, after Kirk restrains him from saving Edith. Year Inside, Hour Outside: When Kirk and Spock re-emerge from the Guardian's portal after having spent the better part of a week in 1930, Scotty asks, "What happened, sir? You only left a moment ago." "Many such journeys are possible. Let me be your gateway." Star Trek S1 E29 "Operation: Annihilate!"